When dealing with the overwhelming task of the dissolution of a loved one’s estate, you don’t need to know how to do it; you just need to know someone who does. The challenge is to be able to distinguish between qualified, experienced estate sales professionals and individuals with fly-by-night operations focused on making a quick buck. 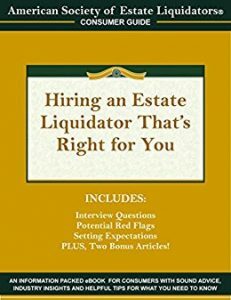 This eBook was written specifically for consumers seeking to better understand the estate liquidation process and what you should know when entrusting the precious possessions of a loved one to an outside resource. This eBook is a small investment that gives you a BIG payoff in peace of mind that you can make the best choice for you.